Don't forget to make a wish in Leon's Giant Drawer of Wishes competition! You've got until Tuesday the 31st of August. To celebrate the launch of its second cookbook, simply titled Naturally Fast Food, London's fast but healthy restaurant chain - Leon - has teamed up with Octopus Publishing Group to make one lucky person's wish come true! 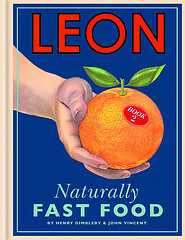 To submit a wish, visit http://www.leonrestaurants.co.uk/wishes (to tweet about it, @leon2wishes). A limited number of people submitting wishes will be selected to attend an event on Wednesday the 15th of September at a yet to be revealed London venue, with one of the attendees actually having his or her wish actually granted. The winning wish will be one that is inventive and closest to Leon’s values. More about the Giant Drawer of Wishes may be found at www.leonrestaurants.co.uk and in our original post about the competition. Naturally Fast Food is a book of two halves. The first half is 'Fast Food', which contains recipes for every occasion that take a maximum of 20 minutes to prepare: from a work day breakfast and children's meals to simple suppers and party food. The second half is 'Slow Fast Food' which contains things that can be made in advance when you have time, to enjoy when you don't have time. There is plenty in both halves for both the experienced cook and the culinary adventurer in search of inspiration. Visit Amazon to secure your copy.